Lady Loft is the first to go in race two, the 3YO Maiden Fillies Plate over 1100m with Brian Higgins to ride. The daughter of Roman Emperor finished second at her last start over 1208m at Sale and has pleased Mike Moroney since. “I thought she ran well last start and she’s done well since,” Moroney said. 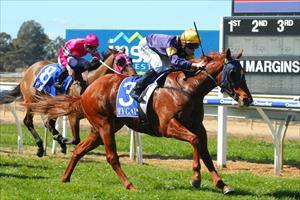 “The soft track should not be a problem as she has run well on them previously. Galaxy Glen is in race three, the Maiden Plate over 2000m where he will jump from barrier 10 with Rhys McLeod to ride. It is a step up in distance for the son of Master Of Design which made ground at his last start when finishing third over 1618m at Echuca. “We don’t think the soft track will inconvenience him but it will make it testing,” Moroney said. “He is handling the preparation well and keeps on improving. “He worked extremely well at his final gallop during the week and we’re very happy with the way he is going. Born To Fight (pictured) is in the last race of the day, the Benchmark 64 Handicap over 1600m with Patrick Moloney to ride and jumping from barrier five after scratchings. It is the sixth run this preparation for Born To Fight which finished fifth behind the unbeaten Fifty Stars over 1400m at Sandown at his last start. “He’s stepping in distance but there’s stamina on his female side and he’s always given us the impression he will get a mile,” Moroney said. “The testing track is a slight worry but his win came on a soft track.